What do you value most? What is the meaning of a successful treatment for you? Most individuals would proclaim that the biggest concern for them is getting the desired outcome from their treatments here at Charmed Medispa. A successful treatment than purely equals fabulous results. A successful treatment is YOUR desired outcome. So, let’s focus on the results. Let’s focus on the outcome. Let’s focus on your beautiful before and after photos which we are proud to share OUR results in our social media and web site (unlike many who are sharing someone else’s work and photos). We are honored actually that our nurse and aestheticians results are still being displayed on other web sites. Can’t take down photos that our your best! However, what we cannot focus on is compromising on what it takes to get you the results. Do not compromise (even if you save $100). If you can only afford to do one syringe of filler but the results take two syringes of filler, wait until you can do it right! The results will be better, the duration of results will be better and most importantly, you will be happy! If you think a 50% improvement will make you happy, let us share that you will focus instead on the 50% that is left not the 50% that is improved. Sorry. That is human nature in the aesthetic industry! We know! Loraine and Shae have over 30 years of combined experience and it has taken an extensive amount of time to get to the place of REALLY knowing what it takes to get the best results. You will have to honor us with your trust in our medical spa decision making and if you do, we promise to deliver. Our focus is to develop a customized program, explain all the details about that plan and then to execute the plan when you are ready. Just yesterday, someone wanted a simple skin care program for a very complex skin care issue. We were able to explain that the appropriate skin care program will be more of a commitment but she will reap the benefits. If we caved to her initial wishes, she would be very disappointed in the outcome. She left Charmed Medispa with a better understanding of what we need to do and she did commit to doing it. If you look at our skin care portfolio, you can see some major skin care changes! After she sees the desired improvement in her skin, THEN we can pull back to a more basic program. Charmed Medispa is here to reinforce what it takes to get a successful result and YOUR results are worth what it takes. We don’t hear people ever say “Wow, I hate feeling good about myself”. 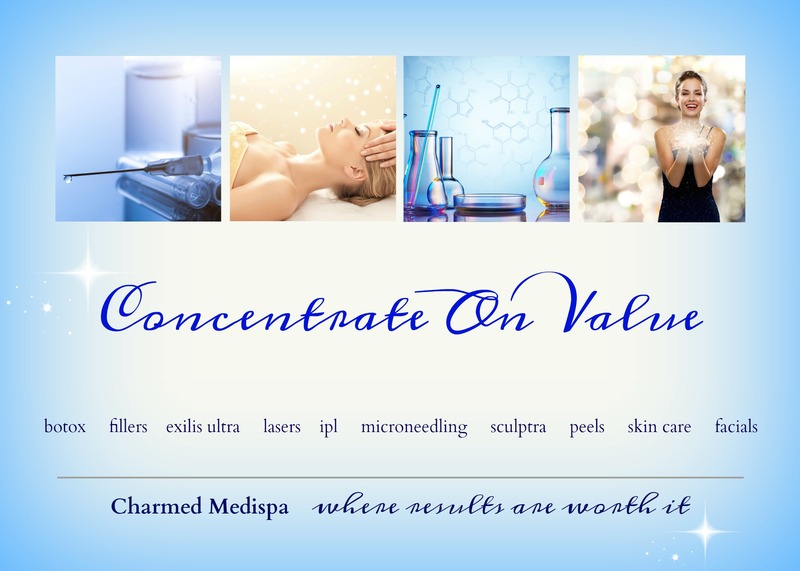 Charmed Medispa specializes in all services in the Delaware area that require no surgery, no downtime and are in office treatments for face and body rejuvenation including botox, dysport, fillers like Restylane, Juvederm and Voluma as well as IPL, microdermabrasions, skin care, facials, Exilis Ultra, Pixel, Affirm, skin tightening, Sculptra and more. We offer the right treatments at the right time for the right person!